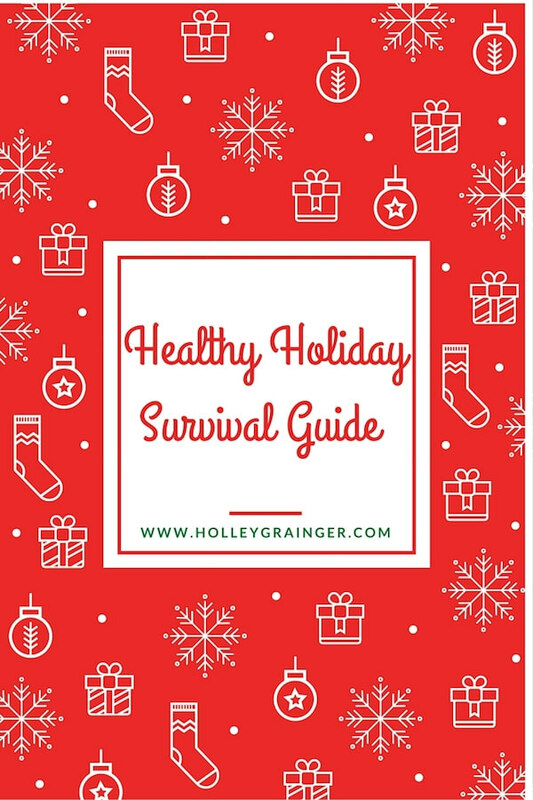 From too much good food and cheer to a case of the hangries at the mall, this healthy holiday survival guide will help you keep your sanity. 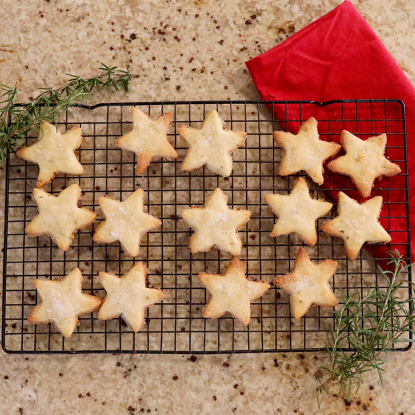 The holidays are an exciting time of year filled with love, good food, family, and friends. However, a bad diet, lack of exercise, too much “cheer,” and too little sleep can wreak havoc on our systems and dampen our holiday spirit. Because, really, how can you fight mall traffic with a case of the hangries? For many, the holidays means that even those with the best intentions may end up throwing caution to the wind and making poor health choices if they don’t do some strategizing and planning ahead of time. So while I am certainly not telling you to pass up your holiday favorites, try these 5 simple tips to help you survive the holiday mayhem while still feeling great and staying healthy. The first thing that many people do when it comes to holiday gatherings is overindulge—both at the bar and the buffet. You often hear people say to alternate every alcoholic beverage with a glass of water. But water can be so boring when we’re feeling festive so I like to dress up sparkling water with some pomegranate juice, lime juice, cranberry juice or a combo of all 3 and serve it in a champagne flute. Not only will the sparkling water hydrate you but you’ll also save around 100 calories per cocktail compared to a glass of champagne. Scan the entire buffet to decide what I want to eat before serving myself. Choose a smaller plate if available (like a salad plate versus a dinner plate) to keep from overserving myself—because, I can always go back for seconds of a favorite food. 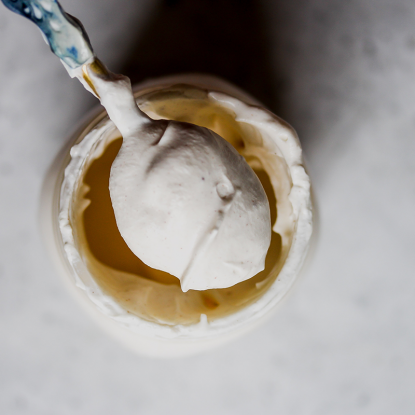 Fill ¾ of my plate with healthier options like fruit and veggies but give myself permission to enjoy something indulgent. I like to make sure that it is really special or something that I can only enjoy at this time of year. 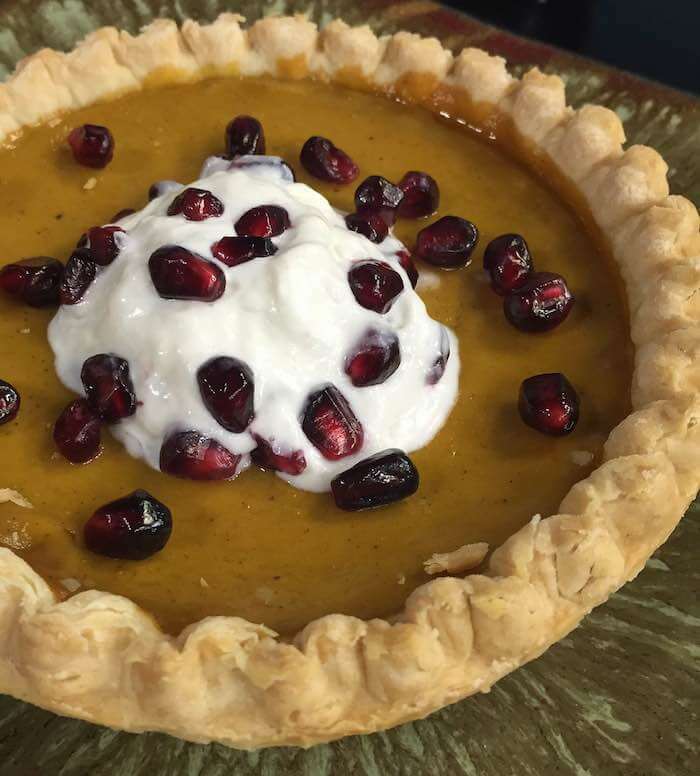 So for example, pomegranates are only available from October through January so if there is an appetizer, dish or dessert made with fresh pomegranate, I always choose that. 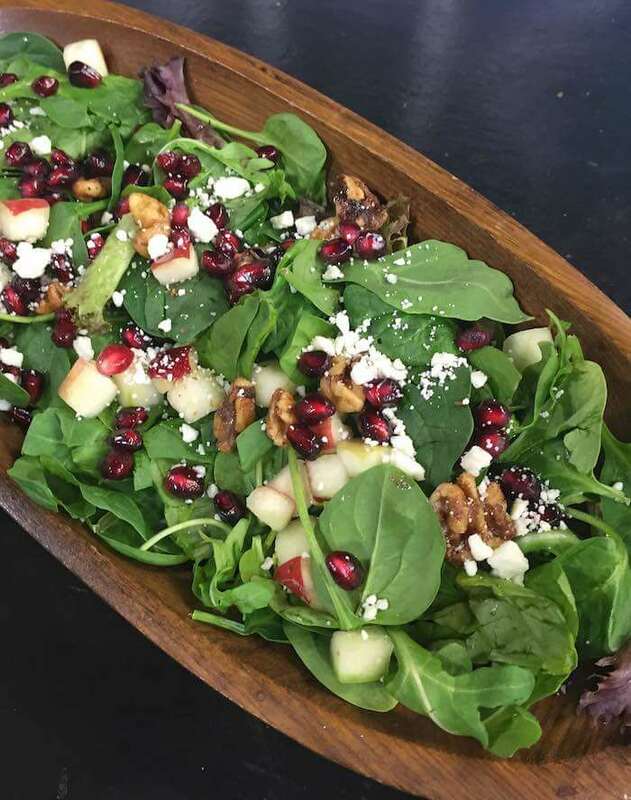 I love this spinach salad that features fresh pomegranate arils. They offer fiber which will help keep me full plus they have the best little burst of flavor in each bite. They’re festive, fun, and I love their sweet and tart flavor. It’s the holidays and the last thing I want you to do is skip my Aunt Angie’s Apple Kuchen or Pecan Pie. However, if your schedule looks like mine then it is likely that you have more than 1 special occasion where sweets will be served. I caught myself eating an Oreo at Ellie’s party the other day and I stopped myself and thought, why am I eating this. Oreos aren’t special to me. There are MANY other holiday foods I would rather have. Of course, I thought this once I had already swallowed it but my point is that be mindful and choose favorites that are special, not just there. 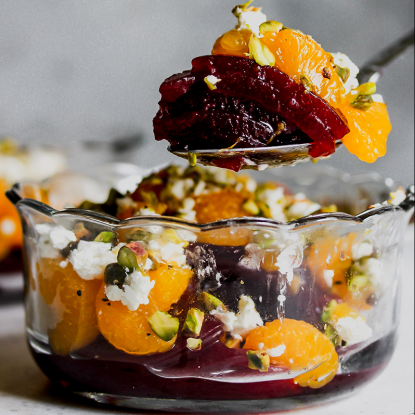 Also, when possible, go for desserts that are made with fresh fruits and vegetables like pumpkin pie or a fruit cobbler. Let’s leave the party scene and talk about shopping–To keep from getting the HANGRIES when I always eat breakfast as well as pack a snack in my person. It forces me to sit down and be mindful of what I’m eating. So often I swallow a bar or something whole when I’m driving and don’t even remember that I ate it. Because you have to crack pistachios, you have to stop and eat and it gives you a visual clue to help you remember that you just ate it. It has healthy fat and is a good source of protein and fiber to help keep me full. 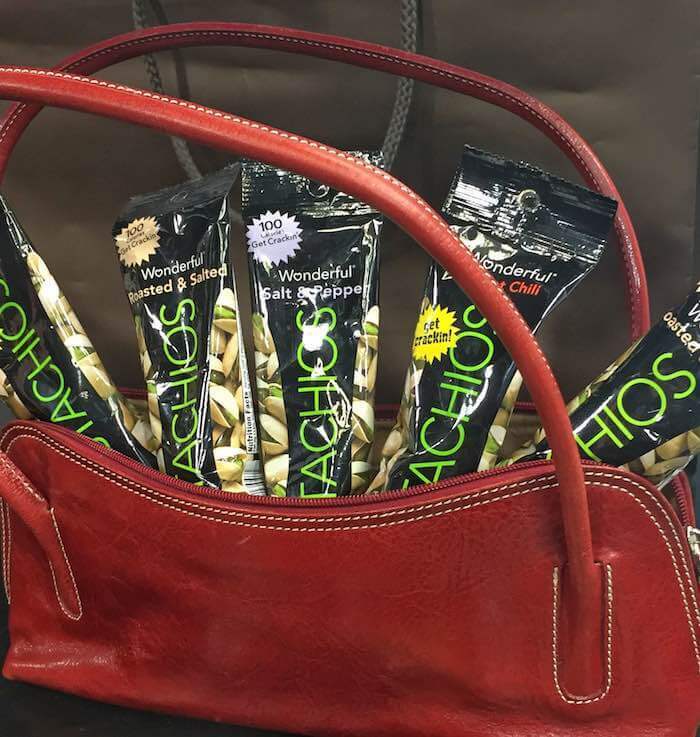 A 100 calorie pack has about 30 pistachios so compare that to chips where you only get about 8. They are delicious on their own or if you like a little flavor you can look for varieties like lightly salted, chili, or salt and pepper. It is hard to make it through the holidays and keep your sanity without sleep. In fact, studies have found that sleepy people overeat and that sleep deprived people don’t have their appetite-regulating hormones, grehlin and leptin, in check. Try unplugging when you get home and keeping electronics shut down at least an hour before bedtime. Also trying going to bed at the same time every night and paying attention to what you eat and erin in the evening. Disclosure: Information shared in this post was part of a TV segment sponsored by Wonderful Pistachios and Pom Wonderful. I was not compensated for this blog post. All thoughts shared are my own.